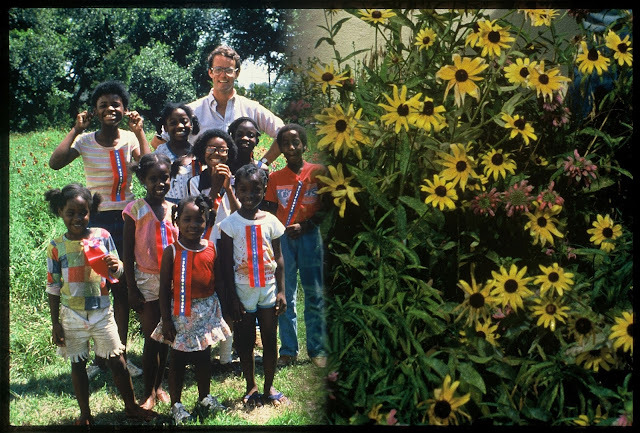 In the early 1970s I was a delegate at the United Nations Educational, Scientific and Cultural Organizations or UNESCO, 16th Conference on the Environment, held in Houston, Texas. The experience caused me to be more aware and empathetic about world-wide problems. In March of 1976 at my Saturday art critique I challenged attendees with the proposition, "What would you do if you were able to do anything in the world?" After each student had been called on they turned the question back to me. By this time I was used to the conscious use of intuition that I had learned from author, inventor and futurist R. Buckminster "Bucky" Fuller at the University of Illinois symposium called "Matrix for the Arts," in 1967 where I was a participant. The result of this learning had already brought me opportunities such as creating the Dallas-based art school the Northwood Institute, the Free University at Lee Park and the training of high school students in the arts as part of Mayor John Erik Jonsson's "Goals for Dallas" initiative. Once in a while I'd have the opportunity to share the following experience with others in my studio. I'd tell them how I had been travelling with my clients in their private planes. I suddenly realized that I could transpose both figuratively and metaphorically the flat concrete roads and runways of the new Dallas/Ft. Worth Airport with the nonfigurative elements of my paintings. The airport's general oval drainage areas among the runways were bordered with black top asphalt which mirrored the bands around the ellipses in my work; the only thing remaining was to install actual wildflowers in place of painted ones. Because of my close association with Françoise Gilot, Dr. Jonas Salk and Fuller's tutelage I realized the environmental benefits of cultivating wildflowers to an exacting new level, coupled with gaining the public's approval of a new aesthetic and replace the still-current preference for residential and commercial water-guzzling green lawns, that we should no longer tolerate because of the worldwide water crisis. If wildflower cultivation and research could be pursued as I indicated, I predicted that unrealized food, fuel, fiber and medicines would be found which could allow for the easy development of the common uses of native plants in landscaping resulting in a marriage of the arts and sciences benefiting and bringing together humankind and nature in a vibrant working relationship. Everyone was rather flabbergasted at the possibilities of my D/FW Airport Wildflower Works. There was an immediate demand that I pursue the concept because with the support of those present, between 20 and 30 people, the idea might be discussed and either ignored, suppressed or misused by others. So I went to Dallas acting mayor Adeline Harrison and she sent me to the Dallas/Ft. Worth airport board to share the idea. I offered to pay the entire cost of the wildflower seeds, which I did. The airport board assigned to me the airport's central area—four miles with 300 feet between the roadways. Johnny Pate was in charge of helping develop the seeding and entirely responsible for the upkeep. An offshoot idea was to harvest the seeds from the seed heads the following season and to sell them to anyone interested. The income generated from selling the seeds, tote bags and tee shirts, etc. to commission new works of art by other artists in a beautification effort for the Dallas/FW Airport. This was all previously documented and agreed upon between the airport board of directors and myself. The concept and effort gained immediate attention and garnered publicity around the U.S. Subsequently, many lectures and honors came my way. Airport officials were shy about the premature media fanfare and wanted to wait until the following spring blossoming. Several tons of lupinus texensis, known as the Texas' state flower the bluebonnet, would by then have been sowed along with several hundred pounds of phlox drummondii, otherwise known as red flax, scarlet flax and crimson flax. To make my vision for the airport's wildflowers tangible, through the winter I painted watercolors madly—85 of them in 125 days! They were related to my earlier works as wells as the Dallas/Ft. Worth Wildflower Works. Historian Sam Blain and my assistant Candice Land began creating a catalog announcing this new dimension in the arts. The widely-considered great American collectors of art, Olga and Joseph Hirshhorn, who already owned my work and had gifted a diptych painting to President Lyndon B. Johnson and Lady Bird, allowed a comment to be published in the catalog. On April 22, 1977 Joan and I were Lady Bird's house guests. I was Lady Bird's dinner partner at a large event honoring biographer Robert Caro and his wife Ina. He took on the responsibility of writing four books about Lyndon B. Johnson. Caro has twice won the Pulitzer Prize for Biography. I had taken some of the watercolors and discussed the Dallas/Ft.Worth Wildflower Works concept with Lady Bird, Mr. and Mrs. Preston Jones, he a famous Texas playwright and Fleur Cowles the morning of the 23rd. (Two decades later the October 1996 issue of Vanity Fair had this to say about Cowles, "...legendary American expatriate, editor, writer, painter, hostess, and philanthropist, is publishing her memoir and "The Best of Flair," an opulent anthology of the dazzling, short-lived magazine that galvanized the literati in the early 1950s.") 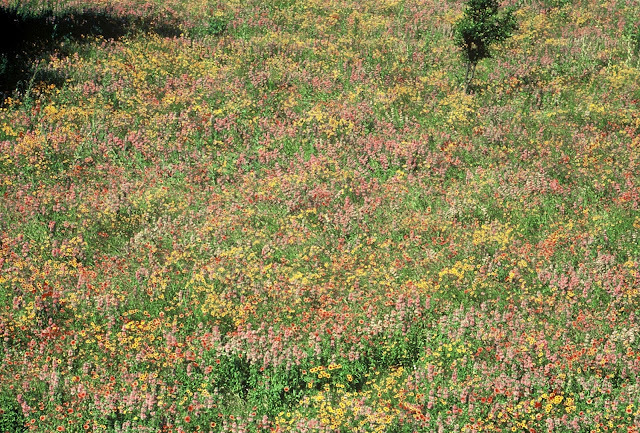 Lady Bird had encouraged the Texas Highway Department to use wildflowers on its highways; they had done so since 1929 after a superintendent realized the beauty and reduced mowing costs. However, Lady Bird said that to her knowledge no one had ever been able to deliberately cultivate them and unless our team succeeded it was just an empty dream. In the spring some early mowing took place. Those plants that had been seeded and that were not destroyed by the early mowing began to make an excellent beginning. The art world and news media had a field day reporting on the blooms. The resulting exhibition of my related watercolors was a huge success. I was invited to give presentations, which I did, such as for the Transportation Research Board (national) at two venues, San Antonio, Texas and Orono, Maine. Art News published a nice story on my new medium. In 1979 the Texas Highway Department hired range scientist Dr. Thomas Jefferson Allen to set up the department to develop better more dependable plantings along many more highways in Texas. As a result of this I began to be a "regular" at the LBJ Ranch. You will recall that in the early 1970s I was President Lyndon B. Johnson's last visitor when I delivered the diptych painting and unexpectedly spent the entire day, one on one, spontaneously discussing his legacy; 36 hours later he was dead. I made a series of what were to be the final photos of a living LBJ. I met Dr. Allen at a symposium attended by many people who worked out of offices in Washington, D.C. and elsewhere. From that day on Dr. Allen and I were joined in mutual effort like Siamese twins; we were this way until his death. His professionalism as a range scientist and his impeccable integrity were the key aspects to our success. Of course I was doing test plantings at my gallery on Fairmount St. and at my homes in Highland Park and Turtle Creek. Unfortunately for us, Johnny Pate and his boss at the D/FW Airport abandoned ship. The replacement boss was a retired military officer. He wanted the airport grounds clipped close like the haircut of a new military recruit. Thus the D/FW Wildflower Works petered out without explanation. I don't expect that we will ever gain any hard evidence that the Dallas Museum of Fine Art's (since renamed Dallas Museum of Art) blacklist had anything to do with the D/FW Wildflower Works demise. However, the occurrences of the museum's and others' efforts to negatively affect the careers of several Dallas artists will be forthcoming in this memoir. The good that came from this experience with the D/FW Wildflower Works is that we proved that cultivation was possible. One mistake (we learn from these too) was not to have the outside general maintenance component under my control. Another misstep was to expect expensive aerial photography to convey the color density and saturation after only one year of a growth cycle; Life Magazine staff had expressed a keen interest in such images. Another error was not accepting the beautiful Lorraine Haacke, art critic with the Dallas Times Herald, to do a Wildflower Works cover story for Braniff International Airways' in-flight magazine. Finally, not understanding how complex the planning and development of outside grounds maintenance would be was a setback; it happened before I met Dr. Allen in 1979. In April of 1980 I was approached by Walt Davis curator at the Dallas Museum of Natural History and later by its director Lou Gore about having a retrospective exhibit of my paintings at the museum. They also expressed a keen interest in my installing a Wildflower Works which would surround that museum building. Walt had become familiar with my work after visiting my gallery in 1979. I shared the proposal with Dr. Allen and when he volunteered his guidance we accepted the offer. At some point during all of this Dr. Allen suffered a heart attack. Amazingly, he was subsequently able to be a full partner in the choice of plant materials and related matters for the creation of the DMNH/Wildflower Works. Walt told me that the Dallas Museum of Fine Art, literally next door, would have to be purposely misled by outdoor signage during the autumn and winter announcing the event. The bogus signage was necessary because we knew that the DMFA was determined to stop me and any other Dallas painter or sculptor from having any important recognition—such as what I once had in Dallas—that could be garnered independent of the DMFA. In fact, this Wildflower Works exhibition and the related artist recognition by the public was why the DMNH would be able to gain free beneficial publicity and foot traffic that natural history museums rarely received; such publicity was the norm for art museums. The museum staff knew that if the DMFA had learned of the show beforehand they would have somehow interfered because it was no secret that the DMFA had lots more clout with city and landlord park district officials. We plunged into making an ambitious catalog and series of lithographs relating to the show. Botanist David Block regularly inspected the progress of our plantings even through the winter. I was disappointed that the DMHN did not contribute anything to the catalog. It would not even accept my cousin Eula Nelms (Mrs. Horace) $10,000 contribution. She intended on taking a federal income tax deduction for her donation. I considered the DMNH's refusal to accept the donation to be a very bad sign! However, I believe that the museum did contribute something to the grand dinner opening party which was catered by my chef son Cole and his wife Lisa. Blossom and Brad Horton were also an integral part of the culinary team. The event was a great success. The exhibition and DMNH/Wildflower Works installation succeeded as planned. Olga and Joseph Hirshhorn came to see the show. Kenny and John Pickens hosted a dinner party for out-of-town guests which included folks from both U.S. coasts. Susan Horton hosted a Sunday brunch for visitors in a setting that surrounded everyone with her extensive collection of my work. The DMNH and its staff had not had such a high level of attention before; as a result they extended the exhibit and Wildflower Works through the next year. I was honored when they asked me to plan a traveling exhibit with them. On weekends bus loads of school age children came for tours. Some of them sent back color drawings in testament to the tours I had conducted. News of the exhibit naturally spilled into the museum's surrounding residential area. The young neighborhood children became our docents. Each was given an official Wildflower Works ribbon to wear. I don't know if the children adopted us but we had wonderful times and enjoyed enhanced community relations with the neighborhood. The museum was affiliated with a local high school club. The club installed a bee hive in a museum window and did interesting experiments. However, their test plots, for which we had furnished seeds, weren't consistently tended and yielded less than satisfactory results. Walt Davis and Lou Gore were invited to give a presentation about the museum's participation in the Wildflower Works at the annual American Association of Museums convention in Philadelphia PA. For that event I donated 450 DMNH/Wildflower Works catalogs that were snapped up by collectors/attendees even before Gore arrived! Their talk drew a standing room only audience and as a result they were asked to repeat the presentation. Obviously flattered by the request, they gladly did so. DMFA museum director Harry Parker must have crawled back to Dallas under the bellies of snakes from the embarrassment of having a natural history museum next door have such a big hit exhibition by a local Dallas painter, yours truly, and unfortunately for the Dallas art scene, the target of a DMFA blacklist. This is where the trouble began; remember, in the power center that is downtown Dallas, the DMFA clearly had much more clout than the DMNH. I had a scale model made for a "portable" room and exhibition for the proposed traveling exhibit. I brought along the model when Walt Davis took me to visit the director of the Hoblitzelle Foundation. Established by Karl and Esther Hoblitzelle in 1942 the foundation makes grants to social service, educational, medical, and other organizations in Texas, especially in the Dallas area. The purpose of our visit was to explore funding for my traveling exhibit. 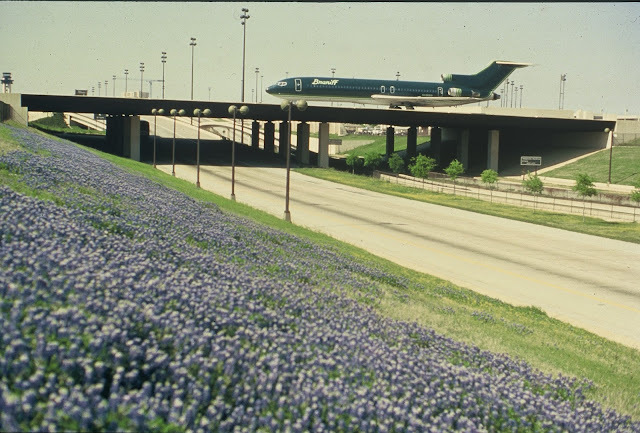 The Hoblitzelle director's son, who happened to be a pilot at the D/FW Airport, said that his fellow pilots created an informal lottery to pick the day the airport's wildflowers would blossom. The DMNH was given an exceptionally long time frame to submit its application for a grant. The Hoblitzelle director personally held open the deadline to file, he did so several times. I realized that in all likelihood the DMFA had intervened and killed the prospect. Sometime around 5:30 p.m. I phoned the mayor about it; he was an executive of Tom Thumb food stores. We arranged to have breakfast the following morning. Since the mayor knew that I headed the campaign to preserve Oak Lawn and particularly the community where my gallery on Fairmount St. was located, (currently the prosperous Uptown area) he thought our meeting was about a neighborhood preservation issue. When I explained how the DMNH had inexplicably balked and missed some application filing deadlines and my suspicion about the DMFA's intervention, he put the director of the park board in touch with me. The park board was the landlord of the parcels used by the DMFA and DMNH. The director's first report was that the DMNH would submit the grant proposal immediately. He promised that if it didn't happen then he would personally provide it. Eventually nothing was ever done. You will hear more of this gentleman, who was also on the National Wildflower Works Center executive committee and about how he was sentenced to a prison term for unlawful behavior in a public park men’s room. The incident was reported by the Dallas newspapers. By now Robert Caro's first book on President Lyndon B. Johnson had been published. As a direct result of LBJ's "insider" connections forged from a career in state and national politics, Caro pointed out in his book that although LBJ was a most capable politician, LBJ had conducted personal business transactions that caused more than a few eyebrows to be raised. Choosing to increase the U.S. involvement in Vietnam War overshadowed LBJ being remembered as being among the greatest of U.S. presidents based on the congressional enactment of his domestic policies. LBJ's political career was flawed only because of his decision to escalate the Vietnam War. The legacy of subsequent American presidents is similarly tarnished for not heeding President Dwight Eisenhower's warning about the military-industrial complex. To offset Caro's sometimes negative content about her husband's personal profit-making deals, Lady Bird sought to create some upbeat publicity hoping to diffuse that unflattering material made public by Caro. And can you guess what Lady Bird chose to do? She had her best friend Patsy Steves of San Antonio, TX ask yours truly to approve and participate in a newly created organization, the National Wildflower Research Center, which was to conduct the necessary research to fully develop the public use of the technical vegetative management system that would result from my Wildflower Works! However, it was foolish of me to agree to participate. I should have known how politics can be played whereby people exploit minds and divert funds for their own benefit. It would have been so much the better for me to have politely declined Lady Bird's offer and instead develop a Wildflower Works entirely on my own. I would have long ago published the findings and recouped my initial monetary investment. In 1979 I had another successful exhibit at my atelier. National recognition flowed for the Wildflower Works concept. If I may say so, my beautifully redone gallery received lots of compliments as did the Lambert house which had a lawn of wildflowers on Turtle Creek Boulevard. My lawn at the gallery prospered--wildflowers were present spring summer and fall with a lawn full of bluebonnets in green rosette stage through winter. Unlike my work, I learned that there were a number of professional and amateur self-styled experts who had "nothing to show" regarding their project's sequential blooming across three seasons of the year. I was travelling about to learn whatever possible about cultivating wildflowers. I gladly presented lots of slide shows at no cost to attendees. However, I sensed that there seemed to be an unlikely possibility for another "Dallas" Wildflower Works. At this juncture I was further convinced that I had become a target of a Dallas Museum of Fine Art blacklist and because I was such an integral part of the Dallas art scene, the blacklist doomed the future of that, too. It was very gratifying to have both the respect and support of so many here in Dallas who could see the importance of the work of art in the community, the world at large as well as the water conservation aspect of the concept. However, the efforts by the DMFA to enforce their censorship of all artists in the community through fear demonstrated their reckless cruelty as well as their historic foolhardiness. In this case the eagerness of the DMNH to enhance its reputation through sharing the related publicity generated by this traveling Wildflower Works exhibition was soon brought to a halt. The project was likely stymied by the more powerful DMFA. The result was that the Wildflower Works was destroyed by being cut back against a specific written agreement and the funding of the traveling exhibit of my work never materialized. As you may know, a blacklist is insidious and obviously unjust. It is illegal punishment for independent souls who believe that we have in fact the right to freedom of expression as guaranteed by the U.S. Constitution. Blacklisting is conveyed through innuendo, libel and a negative "whispering campaign" in order to frighten others. It hopes to deprive its targets of their right to freedom of expression. It seeks to dominate a community of people and have them accept the will of those with power. It strives to make the warning, "YOU MAY BE NEXT!" a cornerstone of its effort. The other disastrous effect of the blacklisting was that my financial portfolio at the First National Bank in Dallas was purposefully misplaced. How could this possibly happen while the bank proudly displayed so much of my work and for such a long time? For example, my "Nine Poplars" painting hung on the most conspicuous bank wall in Dallas. It was hung under a skylight in the bank officers’ formal reception area surrounded by private dining rooms where VIP clients were made to feel pampered and comfortable. Only well-heeled clients visited the bank's ninth floor where bank officer's suites were located; that's where my paintings were in the offices of the chairman of board and top tier vice-presidents. R. H. Stewart III, who headed First National Bank in Dallas since 1959, and his wife Cynthia, who was my pal, art student and tennis partner had been among my most ardent supporters since I arrived in Dallas in the 1950s. Their home was full of my paintings. Their daughter, like others such as Mary McDermott, was sent to counsel with me. Being perceived as a serious painter signaled a caring and idealistic human who young people of that age, those of the 1960s, could trust. If I may say so, such personal characteristics were confirmed by the larger society and well demonstrated by my pivotal role in the creation of the highly popular Free University at Lee Park in Dallas. The public example made by the blacklisting of this leading painter, art dealer, art teacher and fortunate art collector was that I went from having my own bank officer chosen and assigned personally by R.H. Stewart III to handle my financial consultations and portfolio, to subsequently being relegated to visiting an under-the-street pedway booth for my banking needs. The "underground" banking person had no real authority and was not even aware of my bank account or that it had been "demoted" and reassigned. In pursuing the by now widely-acclaimed Wildflower Works concept, of course my expenses grew exponentially. To continue, the only option I had was to sell the most valuable objects of my personal collection such as original works by Alexander Calder, Franz Kline, Robert Motherwell, Henry Moore, Jules Olitski, Larry Poons, Frank Stella and Andy Warhol. I sold them for far less than their worth and risked the viability of my real estate holdings. The benefactors of these sales were some of my best clients, resulting in disastrous consequences for me. Soon I was forced with the double dealings of supposedly respectable clients and friends but also the efforts of others who wished to actually claim credit for the Wildflower Works concept. It is ironic that Austin, Texas storyteller and radio show host John Henry Faulk (who became my friend via Dallas arts patron and promoter Bonnie Leslie) and famous playwright James Maxwell Anderson were also blacklisted in the 1950s. The blacklisted Anderson is the grandfather of our new art museum director and well-documented champion of museum reform, Maxwell L. Anderson. Faulk with his attorney Louis Nizer beat the architect of that blacklist campaign against him, U.S. Senator Joe McCarthy and his backers, in a federal court libel lawsuit. A jury awarded to Faulk three times in damages beyond the amount he had requested. As a result Faulk went on to become a famous First Amendment lecturer and wrote a book about his blacklisting experience called "Fear on Trial." The book was adapted for CBS television. Ironically, CBS had ended Faulk's broadcasting career in the mid 1950s after bowing to pressure from blacklisters. You will learn more in a near future memoir chapter about my 1980s First Amendment "victory" lawsuit after my noncommissioned “Chicago Wildflower Works” (1984 - 2004) artwork was threatened by folks affiliated with the Chicago Park District. With this cast of characters, blacklisting information and historical background we'll see how all this plays out. And given the area's water shortage issues, it will be interesting to see what future generations will have to say about Dallas' neglecting to take advantage of the vast water savings that the Wildflower Works proved was possible; it was a new aesthetic landscape made acceptable to the general public and one waiting to replace a current watering regimen which is no longer affordable. Note: With the exception of the newspaper images, all of the above is copyrighted material, all rights reserved. Permission for use will be considered upon written request. Blog comments are encouraged, the use of actual full names is strongly recommended, as are affiliations with organizations.